A TEAM of veterans from Launchpad – a charity which provides affordable housing with on-site support to Forces veterans and their partners – have come to the aid of their local community with two new projects. The veterans have transformed Newcastle’s St Michael’s Church Drop-In Centre from a run-down and inadequately furnished site into something that is much more attractive and suitable for children. 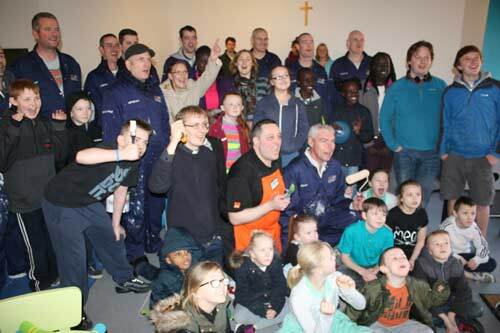 Redevelopment of the centre, which is the only facility available to young people in the area, was made possible by donations of materials from local retailers, including B&Q and the Newbiggin Carpet Centre. The Launchpad veterans also worked at the home of volunteer Janice Downes. Janice, who has been a devoted volunteer for the charity, had her home flooded late last year, causing significant damage to the walls and carpets. As a way of repaying her for all her help and support over the years, including serving up Christmas dinner to 34 hungry Servicemen, the veterans surprised the 67-year-old by giving her home a full makeover, including repainting the walls and re-carpeting the floors. Launchpad helps veterans with the transition from military to civilian life. Their accommodation, Avondale House, is situated in Newcastle’s Byker estate and acts as a base for veterans to seek employment or set up a new business and take care of themselves while contributing to the wider community. Phil Old, Manager of Launchpad’s Avondale House, said: “It has been wonderful for our veterans to be able to help the local community. They have really enjoyed helping Janice; she did so much for the residents of Avondale House.